Doors extend your home's ambience to the great outdoors, visually expanding and brightening any room. And the expanded glass area means added light– so every season is more enjoyable. 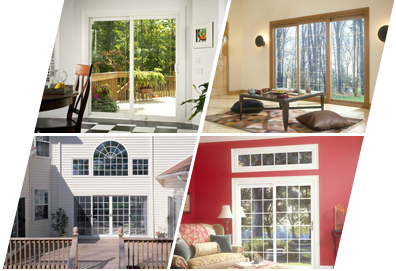 With our wide array of Patio Doors, you'll spend more time enjoying the view and less time on maintenance. These doors never need painting – and cleaning is simple: your favorite household cleaners and a damp cloth will make glass and vinyl surfaces sparkle like new. And for ease of operation and durability, you'll find no better Patio Door. The heavy-duty fiberglass screening is tough; aluminum frames ensures the outer screen door stands up to the test of time, while an adjustable four-point tension system keeps screens on track. Special anodized tracks at the sill resist corrosion to help keep door panels gliding smoothly for years to come. And it's all backed by a Lifetime Limited Warranty for complete peace-of-mind.